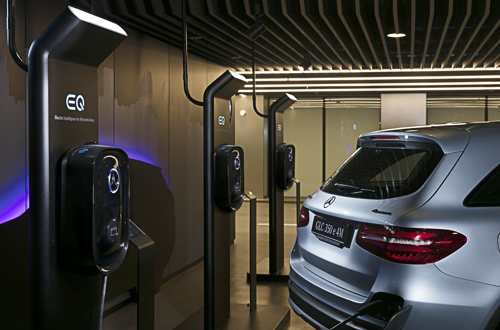 Mercedes-Benz Korea, the local unit of German automaker Mercedes-Benz, said on Thursday it has developed an electric vehicle charging station for its electric sub-brand EQ in cooperation with South Korea’s top telecom company KT Corp. The two companies joined hands in April to develop an electric vehicle charging station for EQ models and have successfully installed the new charging points at 72 Mercedes-Benz dealerships as of Thursday. Not only EQ cars but also all the vehicles using the type 1 charger with a 5-pin connector can use the charger, according to the company. Mercedes-Benz drivers will enjoy free charging services at its dealerships and service centers. The company also will install the new charging facilities in the house of EQ car owners upon request. KT’s EV charging mobile app "Charging Mate" will be upgraded to give information on Mercedes-Benz’s dealerships and service centers from late this month. Mercedes-Benz Korea has launched the New GLC 350 e 4MATIC plug-in hybrid SUV under the EQ brand in Korea and plans to add more models soon including the New C 350 e plug-in hybrid sedan slated for release in the second half of this year and three more models by next year. Mercedes-Benz is the most popular import car brand in Korea. Over the first six months of this year, the German carmaker sold 41,069 vehicles, up 8.9 percent from a year ago. It ranked No. 1 brand in the Korean import car market over the cited period with a 29.3 percent share. BMW trailed with a 24.7 percent share. Mercedes-Benz Korea will continue to seek for new partnership opportunities in Korea to provide better service for its customers, the company official said. Earlier, it partnered with Korea’s BC Card to provide the free charging service for plug-in hybrid buyers who purchase its cars with BC cards.